Q: Why should you be careful if you meet someone whose passport is from the British West Indies? A: Because the British West Indies does not issue passports. Indeed, the British West Indies is not a country: it's a geographic term for a group of islands in the Atlantic including Anguilla, Bermuda, the British Virgin Islands, the Cayman Islands, Montserrat, and the Turks and Caicos Islands. 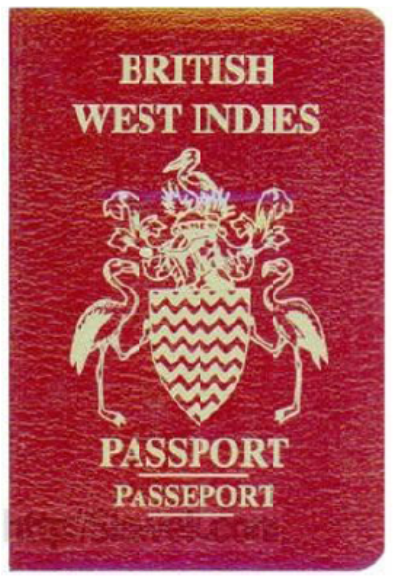 So, why are there people with British West Indies passports? Because there's a market for camouflage passports - fake passports for nonexistent countries. The people who sell these claim they can used for legal purposes like fooling terrorists and hijackers who'll kill you if you're from the United States. That seems eminently practical - as long as these guys aren't too sharp on geography - but it's just possible these documents could be used for shadier purposes, too. Camouflage Passports (CPs) are passports of countries no longer in existence, e.g. former British or Dutch colonies such as Rhodesia, Zanzibar, Dutch Guiana, Netherlands East Indies. These states have usually changed their names, typically after gaining independence. Thus, British Honduras is now Belize, while Zanzibar fused with then time Tanganyika to become today's Tanzania. Upper Volta became Burkina Faso, and of course, some of the most recent examples include the USSR and Czechoslovakia. When American travelers became prime targets of hijacking and international terrorism on an ever increasing scale, CPs were invented to afford them some additional security. The idea was to present a potential hijacker with a valid looking, non-American document to hide one's identity. Thus, it was supposed, terrorists might pick someone else to harp upon, to take hostage or even to kill. CPs were never intended to be used as actual traveling documents at border controls, etc. If you refrain from traveling; if you are in possession of a valid second citizenship for emergency purposes already and have at least some of your assets stowed away in safety (preferably not in the country where you are living most of the time, nor at the place where you actually work); if you are in no need at all of truly anonymous banking - yes, in that case (and in that case alone!) - it might seem a sheer waste of time and money to obtain a CP, unless you are into collecting that sort of curios. However, that will hardly apply to most of us! Plus: you can never actually know before some nasty streak of events whether you are really in safety or not, can you? Far more common than events such as shootings or assaults are those in which extremists are merely obstreperous, arguing with and otherwise defying the officer who pulls them over. The example of Mark Kuncik of Ansonia, Connecticut, is representative of hundreds if not thousands of similar traffic stops across the nation. Pulled over in December 1997 by local police because he had a phony license plate which said "British West Indies," he turned out also to have a suspended driver's license and no car insurance. But Kuncik claimed to be immune from all motor vehicle laws and free from any requirement to carry insurance or registration. He said that any judge that convicted him would be violating his constitutional rights and would be tried for treason. He was arrested. Julie Fortier, Legal loophole allows fake passports, Capital News Online 12 (January 31, 2003). Mark Pitcavage, Flashpoint America: surviving a traffic stop confrontation with an anti-government extremist. This is taken from an Anti-Defamation League website called The Militia Watchdog, which also has a image gallery of fake documents and the like. Camouflage Passports, one of the bigger websites that sell these documents. The quote above comes from here. You can buy a British West Indies Diplomatic Passport and backup credentials for 548 euros, including shipping and handling. Micronations, Warnings and Notices. A fascinating list of reported or suspected frauds involving real or nonexistent small countries, including the British West Indies. In 1997, forged Sealand passports started tuning up around the world. Some of these were used to open bank accounts under false names in various countries. Since few people have ever seen a legitimate Sealand passport (less than 300 exist today) it was difficult for these to be easily detected as forgeries. The source of these forgeries was traced back to the same German man who was involved in the earlier attempt to take Sealand by force. Dubbing himself Minister of Finance, he had created a fake Sealand Business Foundation and boasts that he has sold over 150 000 fake Sealand Passports to all comers. Thus there are now unfortunately 500 times more forged Sealand Passports in circulation than real ones. Many of the forged passports were apparently sold to people leaving Hong Kong at the time of Chinese reoccupation for USD 1 000 each. West Indies (British) Visa Service. How about applying for a visa to visit the British West Indies? Is this site for real, or a scam? Note it mentions "this country", even though there's no such country. Do you need a visa to visit the British West Indies if you have their passport?